Do you know what your Vitamin D level is? You should because MANY people are walking around today with sub-optimal to dangerously low Vitamin D levels. If you find out that your Vitamin D level is low, your doctor may want you to supplement your diet. If so, our 5,000 IU Vitamin D3 from Tishcon, the makers of Q-Gel CoQ10, is our Purest and Most Potent Vitamin D3! Potent? This tiny, easy-to-swallow softgel contains a FULL 5,000 IU of Vitamin D3 in a healthful Olive Oil base. Pure? 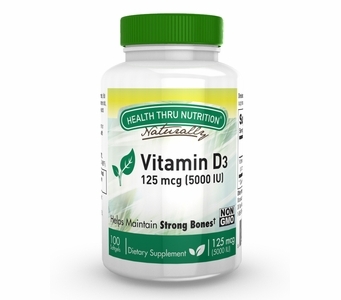 This Vitamin D3 is FREE of Lactose, Trans Fats, Cholesterol, Starch, Sodium, Artificial Colors and Flavors, Sugars and Sugar Alcohols and contains NO Artificial Sweeteners or Preservatives. In addition, Vitamin D3 (5,000 IU) is Free of milk and milk by-products, egg and egg by-products, fish and fish by-products, shell fish and shell fish by-products, tree nuts, wheat and wheat by-products, peanuts and peanut by-products, soybeans and soybean by-products. Free of: Milk and milk by-products, egg and egg by-products, fish and fish by-products, shellfish and shellfish by-products, tree nuts, wheat and wheat by-products, peanuts and peanut by-products, soybeans and soybean by-products & gluten.